Unfortunately we have to repeat most of the cell preps I made for the big planned RNA-seq analysis , because our RNA preps used up all the cells without producing any RNA. The main problem was that we were using a Qiagen RNeasy Plus kit (designed to remove contaminating DNA) instead of the usual plain RNeasy kit. I had bought the Plus kit because of a cheap introductory price, planning to just leave out the final 'on-column DNase digestion step, since this hadn't been very effective in the past. 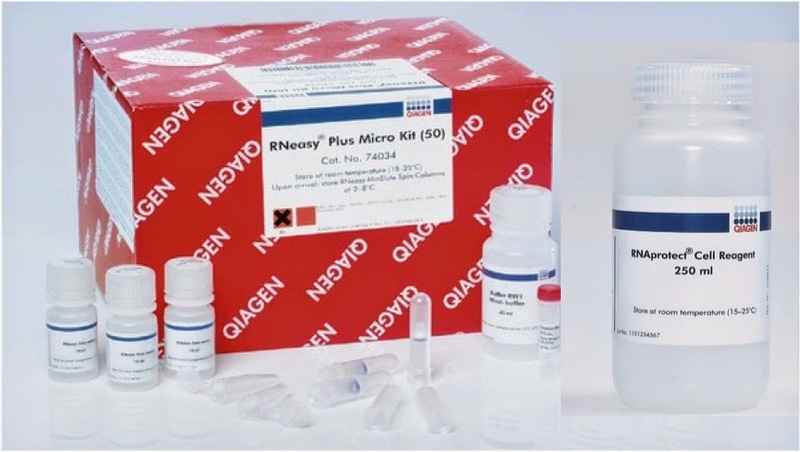 However Qiagen had changed the kit without changing its name, replacing the final 'on-column' digestion with an initial pass through a 'G-DNA eliminator column' (before the usual RNeasy column steps). The kit instructions didn't say anything about its suitability for bacterial cells, so I contacted Qiagen technical support. They assured me that, although the kit would not remove DNA from bacterial cells, it would give a normal recovery of RNA. What they didn't tell me was that the initial detergent treatment would not lyse bacterial cells - at least I think this must be the reason we didn't find any RNA when we ran all our RNA samples in a gel and a Nanodrop spec. We had also processed some samples with the normal RNeasy kit, but most of these can't be used because we need complete sets of samples from replicate cultures. Qiagen responded bvery well to my complaint about our results, providing us with two new RNeasy kits and 500 ml of the RNA Protect solution. But we still have to do the work of regenerating the samples. 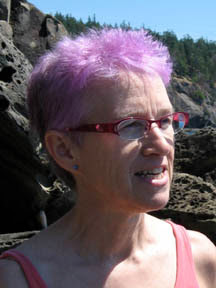 Luckily we have a very competent new technician, hired through UBC's Biology CO-op program, and she's doing most of the work. In particular she's regenerating the samples of cells during induction of competence by our MIV starvation medium. But tomorrow I'm going to (finally) spend a day in the lab generating all the samples from cells growing in rich medium. This is 9 cultures, with 3 samples from each. I'm collecting cells at three different densities: OD600 = 0.02, 0.6 and 1.0. I freeze pellets from 2 ml of cells for RNA prep (3 tubes with 0.67 ml cells and 1.3 ml RNA-Protect) and 1 ml of cells with 0.25 ml 80% glycerol, for later testing of transformation frequency if needed. The OD 0.02 cells need to be concentrated 10-fold before freezing so we'll get enough RNA from them, so I need to start with a larger-than-usual volume of cells - last time I used 75 ml. I'll be starting with the OD=0.02 cells frozen in glycerol in the last preps, rather than from fresh cultures. These cells are already in log phase; I'll just pellet them to remove the glycerol and resuspend them in the 75 ml sBHI. The initial density will be about OD=0.003, but previous experiments suggest that not all these cells will be viable, so the cultures may take several hr to grow back to OD=0.02. Then I'll concentrate 40 ml by filtration, resuspend the cells in 4 ml, and freeze 2 ml for RNA and 1 ml for competence assay. The remaining culture (~ 20 ml after OD sampling) will continue shaking to OD=0.6 and OD=1. I'll need to have the filters ready, and all the tubes to put the samples into, each labelled and preloaded with RNA-Protect or glycerol. Hi Rosie, why not use higher numbers of replicates, and the same number of replicates in each group? From experience you're much more likely to detect differential expression with four replicates; five or six is best. If this is an RNA-seq experiment you are planning then at four reps for each group youd have 20 samples which when multiplexed ina v4 SE50 HiSeq lane would give 10-15M reads each, perfect for DE. You may be interested in this post I wrote: cheap RNA-seq. PS: I'm a real fan of how your group uses the blog. If it's cheap I'm interested, since we're almost broke!